When I was a kid growing up in Queens, we spent many weekends trekking into the city, and for us, there was only one way to get there: the New York City subway system. We’d take the E or the F train to mid-town Manhattan. Once there, we became creatures of habit. First, we’d go to Radio City Music Hall, where we’d take in the latest Doris Day flick, followed by a spectacular show, featuring the world-famous New York City Rockettes. Then, lunch at our favorite automat, the Horn & Hardart, where individual servings of Salisbury steak, macaroni and cheese, and warm apple pie were neatly displayed behind glass cubicles. You’d insert a few nickels in the coin-operated slot next to the food item of your choice. The door would unlock, and–voilà!–a fresh, tasty dish, piping hot from the oven, was yours for the taking. 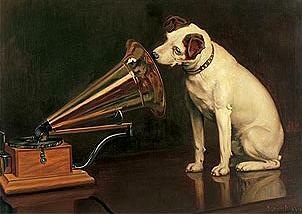 “His Master’s Voice” was RCA’s trademark, depicting this real dog, Nipper, listening to his owner’s voice on a phonograph. After our meal, we’d cross the street to the RCA building, where you could see a life-size version of the RCA dog, proudly listening to his “master’s voice.” How I loved that terrier and so wanted one of my own. Sometimes, we’d stop by the Time-Life building, too, to view the photo exhibit in the lobby area. During the holidays, we were sure to visit Rockefeller Center and gaze upon the breathtaking Christmas tree, all decked out in dazzling lights that reflected upon the skaters below. Then, there were times when we’d take the uptown express to the Metropolitan Museum of Art. I loved our trips to the city. Whenever we went, no matter where we’d go, these were magical times, indeed. Taking the subway was the only way to go. If you ask me, it was the fastest way to maneuver through the city. I was fascinated by the long, pitch-black tunnels that stretched from one end of the city to the other, crisscrossing it (see map), in a mad-dash attempt to keep New Yorkers, moving. I took comfort in the whoosh of the express train as it sped through each station. The rattle and clatter as it swayed side to side, and the lights that would turn off at random moments, leaving passengers in utter darkness. It was enough to stir the imagination of any wide-eyed child. It was more than enough to inspire me to write this poem about the subway of my youth. On a clear afternoon in November. Scummy from a thousand rides before. Fingers curled tightly around the seat’s edge. While the train howled down through the tunnel. In anticipation and—OH the lights came on! Like purple goblins dancing maniacally in the wind. I could still hear the laughter from the Uptown Express. I saw your comment on one of Shary Hover’s posts and thought I would drop by your blog. I’m glad I did. Your poem is wonderful and your blog is packed with wonderful posts. In my pre-teen years, my best friends and I went to Radio City every year for the Christmas show. I remember standing in line (freezing), to get in before 11:00 a.m., when the tickets were cheaper. Of course, there was the subway — the only reasonable way to make the trek from Brooklyn. There were times, too, when I traveled by subway, as a young girl, with my father, caught up in the magic of being in the first car — i.e., the first to see the light in the station as we approached. Something in me remains forever a city girl (having lived in the heart of it for many years). 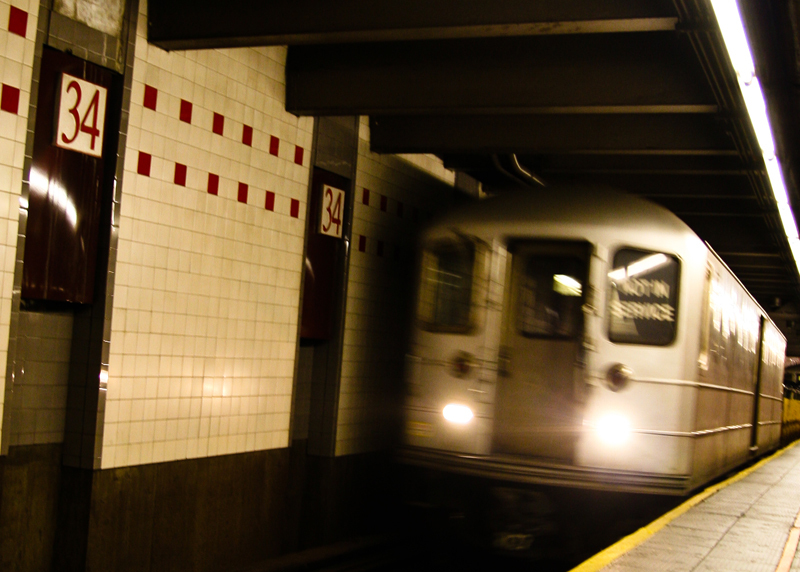 The subway is a constant, as much a part of the New York experience as the Empire State Building. And you do indeed capture, in your post and your lovely poem, the screech and the frenzy and, yes, the magic. Would love to meet you when you do come for that visit. What would New York be without all that shopping! I love to shop there and often find myself pining to go back just so I can hit the stores. I love your apples and oranges comment. It’s so true! Btw, I lived outside DC for a while and your city, true, has an entirely different flavor, but has much to offer, too. All the history, for one thing. Besides, you’re close enough to New York to be able to go once in a while, so good for you! You had the childhood I dreamed about. The first time I saw New York I thought my whole body had been plugged into an electrical outlet. I remember my first subway ride, rotating door, buzzer for letting someone in, bagel – I’m southern we were more into biscuits – visit to the MOMA, Central Park, plays on Broadway….are you sick of my reminiscing yet? Christmas in NY? Fabulous! There’s just something about walking through the city decked in finery, boots, scarves and hats and then slipping into a little diner for a cup coffee or glass of wine. Perfection. All those things you mention, we did and we did often. The city was ours. I cannot tell you how many times we went to the top of the Empire State Building, or to the Statue of Liberty, particularly when we had out-of-town visitors. Shopping at Macy’s, and browsing at F.A.O. Schwartz was so much fun. Sure, I’d whine about going to the Macy’s Thanksgiving Day Parade, but only because it was too cold out. Or rainy. Besides, I was just a kid. I got to see Mary Martin’s performance of Maria in “Sound of Music” on Broadway. I saw Zero Mostel in “Fiddler on the Roof.” Later, when I was in college I saw Liza Minnelli in “Chicago” and Angela Lansbury in “Sweeney Todd.” My love affair with Broadway started when I was just learning to walk. Your use of detail is masterful. We are right there with you. Thank you, Kate! I’m thrilled you enjoyed my poem! Love, love, LOVE this! NYC is one of my favorite places and I felt like I was right there with you. Your poem is magic. Thanks for sharing. Thanks so much, Becky. I’m planning a trip to New York next summer and I cannot wait to go back! Wonderful, Monica. The memories of your trips to the city are priceless. How lucky you were to enjoy such sights as a child. I also loved your poem. You put us right in that subway and on that ride. Great post. I grew up on a farm in Wisconsin 30 miles from the nearest city. How I envy you; my brother lives in NYC now. Visited him once. Your poem really captures the subway experience. Thanks for sharing. Thanks for a visual tour. You made me also hear what that experience was like and I’ve never taken a NY subway. I kept imagining the poem as a picture book; Brother tugging at his tie, a little girl dressed in a pretty coat sitting and going through dark tunnels, the woman towering above two scared children while Mother slept, etc…It’s so nostalgic and picturesque. Lucky you, growing up in the “city that doesn’t sleep”! I’ve only visited New York a few times, but it was amazing and busy and different from the Midwest. Rockefeller Center was fabulous during the Christmas season, too! Great poem. Thanks for sharing. And I love that RCA dog. Haven’t seen that image in quite some time. That RCA dog is from a painting created in the 19th century! RCA used it to create it’s own image around it. It’s got quite a history. Monica, lovely images, fabulous memories. Kim, it all comes down to my love affair with the city, The Big A. Thanks for reading! Yep, this is my homage to trains, I suppose. I have many years and lots off memories of riding on the subway and also, taking the commuter train from Long Island to the city. Monica, I love this! You should send it to the subway transportation management system – you make the subway so magical and wondrous that they could use it in an advertising campaign! Really? I hadn’t thought about that. Wouldn’t it work better as a book for kids? Just wondering. SO enjoyed all of this! I agree with Shary, your imagery is so vivid, I feel like I’m there with you. The poem was wonderful! Just trying to capture the wild ride that is the NYC transit system. Glad you liked it! So vivid. I love how you take us right there with you. A few Christmas memories to make us feel warm and fuzzy and then a shivery thrill from your poem just in time for Halloween.